A look at some of the jobs necessary to do in the garden in August. 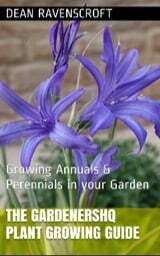 The August gardening jobs list has been split into four main sections. The first three are aimed at people living in the Northern Hemisphere, and the fouth topic is aimed for those living in the southern Hemisphere, who have a opposite gardening season. It is a good time of year to order bulbs. Beans: Sow to Mid August. Harvest in around 55 days time. Broccoli: Sow to Mid August. Harvest in around 60 to 70 days time. Cabbage: Sow to Mid August. Harvest in around 60 to 75 days time. Kale: Sow throughout August. Harvest in around 55 to 65 days time. Kohlrabi: Sow throughout August. Harvest in around 40 to 50 days time. Lettuce: Sow through to Mid September. Harvest in around 40 to 50 days time. Mustard: Sow throughout August. Harvest in around 35 to 45 days time. Summer Squash: Sow to Mid August. Harvest in around 40 to 50 days time. 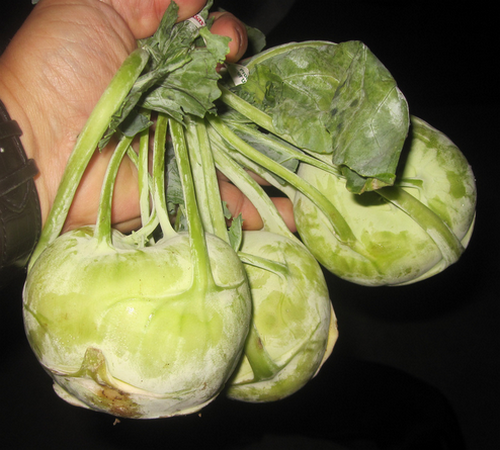 Sow Kohlrabi throughout the month. Photograph by Tony Alter. Also sow out spring Cabbage, Turnips and Swiss Chard. It is also a great time of year to plant out new Strawberry plants. It is a great time to start drying Oregano, cut back at the stems, and hang upside down in a dark and dry space that has good ventilation. It should take about a week to dry the herbs, they can then be stored in glass jars until ready for use. If you have Lavender growing then dry in the same manner as above, but this time store in potpourri bags to bring fragrance to your home. Harvest Beans, Courgetters, Rhubarb, Potatoes when they are ready. 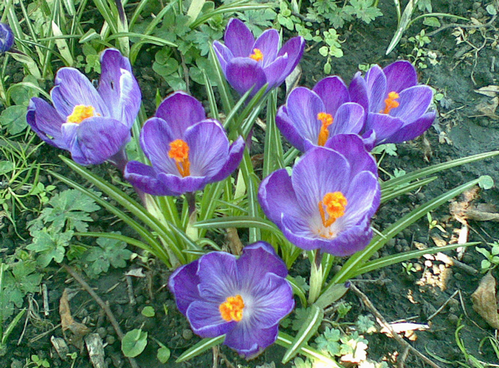 Plant out Daffodils, Crocuses and Fritillaria imperials. Pinch off the tops of Tomatoes in mid/late August. This will divert the plants energy into fruit production. Plants growing in pots should be fed every two weeks, this will help to prolong their life through to the end of Summer. Unless you are after seeds be sure to deadhead flowering plants such as Delphiniums and Lupins, as this will encourage further blooming. Regular harvesting of crops should encourages many species such as beans to produce more produce. Seed harvesting tip: if you are collecting seeds from a plant, it is a good idea to put a small paper bag over the flower/seed head. Once seeds are mature cut off the flower at the stem. Then rub the bag in between your hands, and carefully remove the stem/flower head. The seeds should now be in the bottom of the bag. Depending upon the plant species either sow out fresh, or store seeds in paper bags (with their names on) in a cool and dark place. Pond water can rapidly evaporate in hot heat, be sure to top up with fresh water regularly. Herbs should be cut back to encourage a second harvest; cut back any signs of the bolting (flowering stems) in herbs such as Basil, Rocket and Parsley. Although it is only august it is a good time of year to prune Wisteria, Hedges and many summer flowering Shrubs. Their growing season is nearly at an end at this time of year, and if you prune them now then you can save yourself from getting wet and cold by delaying pruning to autumn. If you have a new hedge then reduce its volume by about a third. This will encourage healthy growth. Lots of watering to be done at this time of year, especially for thirsty vegetables such as Celery, Fennel and Runner Beans. The Lawn may require edging and regular mowing. Although a lawn will appreciate watering, if water is scarce then concentrate on vegetables and flowers, as grass is hardy and can recover from dry spells. Rambling roses can be pruned once they have finished flowering. Prune Raspberries once they have finished bearing fruit. It can get very hot in the greenhouse at this time of year. Be sure to water all pots and grow bags every morning. Once a week you should add liquid fertilizer, this will ensure the plants growing in the greenhouse get all the nutrients that they require. To help keep the greenhouse cool damp down the floor every morning. If you are growing Tomatoes then pick off the lower leaves; this will allow air movement around the plant, and increase their exposure to light. Plant Freesias and hardy (spring flowering) annuals. Sow out Parsley seeds and Winter Lettuce. Apply a 4 inch (10cm) layer of mulch to your beds. This will help to retain moisture in the soil when the weather warms up. It is a good time of year to start seedlings off indoors, for transplanting out in the spring. Apply a slow release fertilizer to your plants, to give them a healthy start to the growing season. Hopefully you would have pruned your roses back by now, but if not do so before they start to grow prolifically. Cut at an angle of 45 degrees, as this will help to prevent diseases.